Invisible tape disappears on paper and won't show on copies. Pulls off roll smoothly and cuts easily. Resists splitting, tearing. Easy to handle and apply. Can be written on. 1" core. 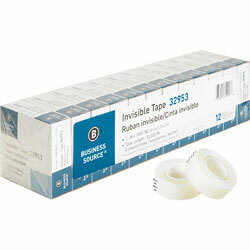 Clear Tape from Business Source! 15886 In Stock today.